Home » Commercial Cabinetry » Time To Remodel Your Retail Store? Time To Remodel Your Retail Store? Is it time to remodel your retail store? Maybe you’re adding another location? Whatever your commercial cabinetry needs are, Creative Surfaces is just one call away. Take this project in Brandon, SD. Harms Oils is in process of remodeling several of their locations. 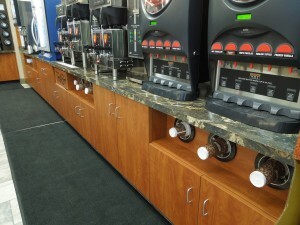 This is just one of several convenience store locations that Creative Surfaces has helped them remodel and there are several others in the works. Whether you are looking to remodel your storefront or have purchased a new location, Creative Surfaces can provide you with the most effective solutions. For more than 25 years, Creative Surfaces has been designing and manufacturing totally customized solutions for retail fixtures and display needs. We specialize in manufacturing retail environments as well as custom casework and millwork for a variety of industries…including retail stores, banks, hotels, fitness centers, restaurants, automotive and casinos. Our state-of-the-art manufacturing equipment allows us to provide the highest quality custom casework and fixtures in the industry. And, with our team of AutoCAD technicians, we can even help you design the perfect custom fixture configuration for your retail store that will meet your unique needs. At Creative Surfaces, we have 130,000 square feet of manufacturing space and are committed to producing a quality product on time and within budget.